No. 16, Jalan Angklung 33/20, Seksyen 33, 40400 Shah Alam, Selangor, Malaysia. 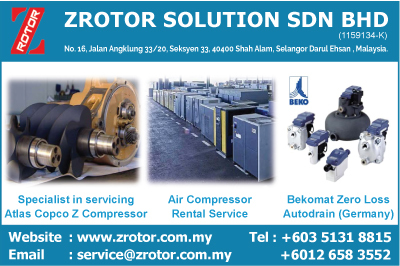 Zrotor Solution Sdn Bhd is one stop solution provider for Atlas Copco Oil Free compressed air system. With experienced service and engineering team , we aim to maximize the efficiency and productivity of your compressed air system. To provide superior service and bring the optimum value to the customer are the company's goal.